South Korea’s Ministry of National Defense on Monday denied allegations that the presidential office had instructed the military to cancel a scheduled ballistic missile test out of concern that it would hamper inter-Korean detente. The ministry’s spokesperson Choi Hyun-soo told reporters that while the military had changed the schedule for the flight test for a long-range, surface-to-air missile, the decision was to do with “technical issues” rather than political reasons. 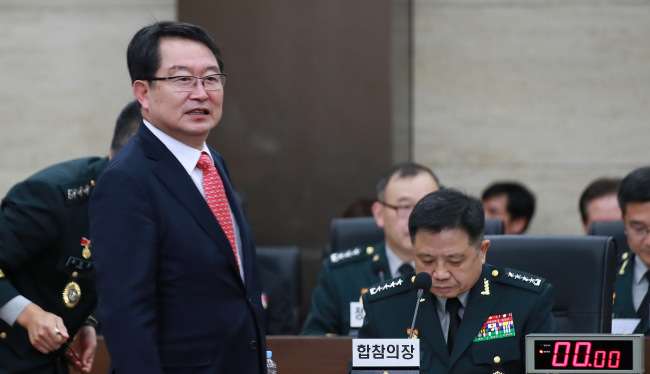 The remark came a day after an opposition lawmaker raised the allegation that the Defense Ministry was instructed by Cheong Wa Dae to cancel a scheduled flight test for a L-SAM in April when the country prepared for a summit with North Korea. Rep. Baek Seung-joo of the conservative Liberty Korea Party said while the flight test was rescheduled in and around June, it was delayed again when Seoul sought to mediate Pyongyang and Washington for their first-ever summit in Singapore. If the delay in the development of the L-SAM system continues, the lawmaker warned the system would not be deployed as scheduled. The missile defense system is expected go into production in 2023 after development is completed in 2018. “In a situation when North Korea’s nuclear and missile threats persist, delaying the acquisition of a weapons system for self-defense purposes is nothing more than giving up military sovereignty,” the lawmaker said in a press release. Speculation has risen in Seoul that the military seeks a change to its plan to build an advanced three-tier missile defense system by the mid-2020s amid concerted efforts to ease cross-border tensions with North Korea. During a meeting with lawmakers Friday, the Joint Chiefs of Staff said that in accordance with denuclearization talks with North Korea, there could be “flexibility” in the military’s consideration of establishing the missile defense system and deploying US strategic assets. Designed to shoot down North Korea’s ballistic missiles in their terminal phase, L-SAM is a key component of the Korean Air and Missile Defense system that constitutes South Korea’s three-layered missile defense system. Kill Chain is designed to strike North Korea’s missile facilities before missiles are launched. KAMD involves shooting down the missiles midair before they reach their intended target. KMPR involves striking Pyongyang’s command posts in retaliation. Meanwhile, the Defense Acquisition Program Administration on Monday hinted at possibilities that the military’s plan of deploying a short-range ballistic missile system targeting North Korea’s long-range artilleries would be delayed. In reports to lawmakers for a parliamentary audit Monday, the military procurement agency said it could not sign a contract for producing the Korea Tactical Surface-to-Surface Missile within the year, as the test for the weapons system has not yet been completed. Dubbed the “artillery killer” by military officers here, the KTSSM is thought to be capable of hitting targets with 2-meter accuracy from a range of more than 120 kilometers. The missiles can also penetrate bunkers and other underground facilities.